One of the most important preparations you will make as you get ready to work with your clay is to make certain that it is homogeneous in stiffness and has no air pockets. This is most often accomplished through wedging. Wedging also can bring clay to the proper consistency for forming. The most popular methods to wedge your clay are the cut and slap method, cylinder wedging, and cone wedging. 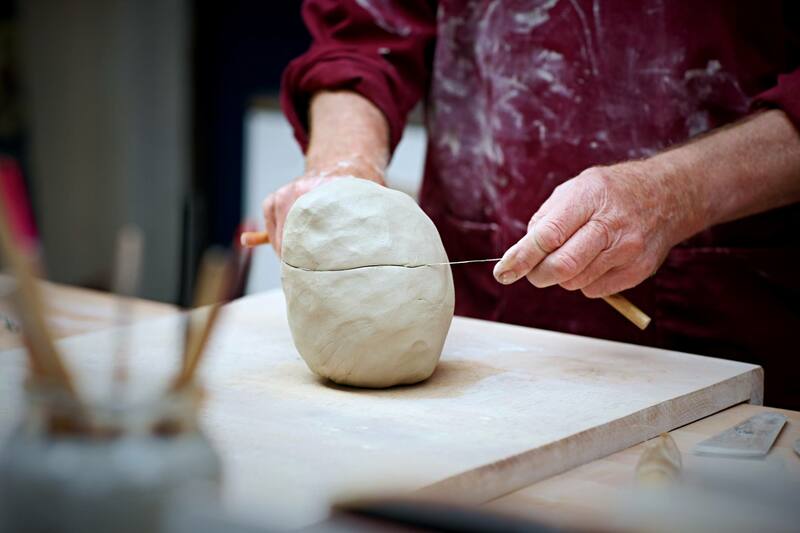 For all wedging, the clay should be worked on a plaster or canvas surface; wedging is easiest if the person is standing. This method can take practice to be able to do it without introducing air pockets, but it is useful for those who have muscle or joint problems. The two kneading-style methods, cylinder, and cone wedging, which places strain on the hands and wrists. Cone wedging is another kneading-like method. Ten pounds of clay can be wedged at one time (or up to twenty pounds, if the person's wrists are strong). Cone wedging tends to be faster than cylinder wedging, once the basic skill has been learned. Many potters also like cone wedging because the cone shape the clay is left in is conducive to centering and throwing the clay on the wheel.